Many people ask me how Richard and I met. It was through our mutual friend Ceila Lee who has been climbing at Joe Rockheads for years. Ceila was my neighbour at the DuMaurier apartments. Shortly after we met, we became good friends (she, her dog Bailey, Charlie and me). Ceila was the one who got me into climbing in the first place. She knew Rich from the gym and they had both graduated from the University of Toronto as well. Ceila would often tell me, after I had finished some hair-brained thought, “You really need to meet this guy Richard, I really think it would be a meeting of the minds.” I ignored her. 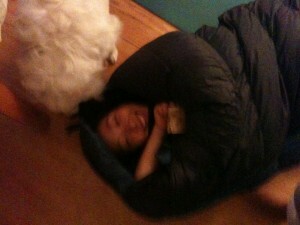 Ceila in my sleeping bag with Bailey trying to lick her face. Weeks (maybe months) later, Ceila had a birthday party. Richard and I had been chatting casually the week leading up to her birthday and at the party we spent every moment together and were inseparable since. That was late November 2009. I tell people the moment I knew Richard was the one was when he bought a hairdryer for his bachelor apartment so that I could stay over without having to pack an elaborate overnight bag. I think I might have actually known on that first date at Ceila’s birthday party. By April 2010, we had packed our apartments, quit our jobs, and hit the road together in a minivan.